Pair of Japanese Sandal Straps blue assorted patterns, replacement "Hanao"
Flowers on a pink background. Weight of the kimono: 885gr. A (Total length): 150cm/59” approx. MATERIAL . CONDITION . People, horses, boats and trees on a dark green background. Weight of the juban: 390gr. Wool, very thin material. This item of clothing is made of wool, not the thick heavy kind that you find in knitted jumpers, but fine as in a cotton fabric. Dark brown vertical striped pattern. This is a pale baby blue Japanese kimono with a pattern of coniferous trees and mountains around the bottom third. Made in and imported from Japan. Used: the lining has yellowed with age and can be seen on the outside of the kimono as a yellowed shadow in the bottom half and on the sleeves. Il existe des haori dans toutes les matières. HAORI - MARRON ET BAMBOUS 1374. 羽織 VERITABLE HAORI JAPONAIS. Doublure intérieure état excellent. Haorihimo PRESENTS (petites ficelles tressées décoratives). Abstract designs on a grey background. Weight of the juban: 375gr. All the defects you can see in the photos, in real life are less noticeable. C (Side seam to side seam across back): 61cm/24” approx. HAORI - SHIBORI 1440. Il existe des haori dans toutes les matières. Le SHIBORI est une très vieille technique de teinture de la soie, consistant à faire de nombreux petits noeuds sur le tissu avant de le tremper dans la teinture. Il existe des haori dans toutes les matières. Haorihimo ABSENTS. Quelques fils tirés par endroit. Quelques traces et taches légères. HAORI - Rose motifs géomètriques 1369. 羽織 VERITABLE HAORI JAPONAIS. Weight of the kimono: 925gr. A (Total length): 158cm/62.2” approx. MATERIAL . Traditional Korean Dress. Turquoise dress, white jacket. Length from shoulder 60". armpit to armpit ~ top 38". best fit UK 12. Birds and flowers on a teal colour background. Weight of the kimono: 1000gr. Used but in an exceptionally good condition, except for the collar which is very slightly soiled. A (Total length): 155cm/61” approx. Design / Pattern: SUMINAGASHI (marbling) background, Gold embroidery, Peacock, Peony. This KIMONO is designed with high-level artistry Japanese traditional technique by hand work. In my view this would be best fit for UK ladies size 10-14. Brocade style of raised flower pattern on a dark pink coloured background. Weight of the kimono: 970gr. A (Total length): 162cm/63.7” approx. MATERIAL . CONDITION . Boats, houses and bridges on a green background. Wool, very thin fabric. This juban is made of wool, not the thick heavy kind that you find in knitted jumpers, but fine as in a cotton fabric. Weight of the juban: 440gr. Design / Pattern: Flower background, Embroidered family crest, Arabesque. This KIMONO is designed with high-level artistry Japanese traditional technique by hand work. In my view this would be best fit for UK ladies size 8-12. This KIMONO is designed with high-level artistry Japanese traditional technique by hand work. In my view this would be best fit for UK ladies size 8-12. 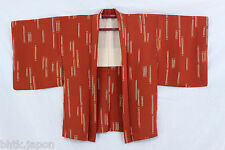 Also applicable to larger sizes, because kimono is adjustable due to the overlapping at front. Il existe des haori dans toutes les matières. HAORI - OISEAUX ET FLEURS 1445 L/XL. Haori vendu seul et sans accessoire. Etat très bon. Quelques traces mineures et défauts mineurs dûs à l'âge. Haorihimo ABSENTS. 作務衣 - Samue - Tenue traditionnelle japonaise. Pratique et facile à entretenir, c'est une tenue idéale pour les durs abeurs ! IMPORT DIRECT JAPON - Objet fabriqué en Chine pour le compte d'une société japonaise puis importé depuis Fukuoka. Pflegehinweis: Nur Handwäsche mit kaltem Wasser. Mit Ähnlichen Farben waschen. Nicht Trockner geeignet. die Bankverbindung wird automatisch angezeigt. Hinweis:Durch unterschiedliche Hard- oder Software kann es zu farblichen. Used, very good condition except for three super small holes on the back.We have removed the thread where it had been turned up to make this kimono shorter, it is now the original length and in a great condition but will need dry-cleaning and ironing to remove the old hemline crease. Yukata - Daruma NOIR (LL). 100% coton - coloris noir, motifs daruma blancs et rouges, kanji en lettres dorées. 3 cm de large pour 150 cm de long. 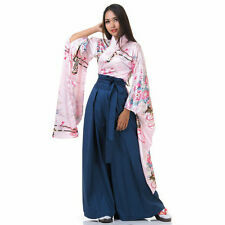 Le yukata est le kimono le plus léger et le plus simple à porter. HAORI - Ryokan haori. 旅館羽織 RYOKAN HAORI. Muni de 4 attaches (pour le port droit ou croisé) ainsi que de 2 grandes poches, ce ryokan haori sera vite indispensable à vos yeux ! - ryokan yukata (dans la rubrique "Yukata"). Il existe des haori dans toutes les matières. HAORI - FLORAL 1444 L. Haori vendu seul et sans accessoire. Etat bon/très bon. Quelques traces mineures et défauts mineurs dûs à l'âge. Doublure intérieure correcte/bonne. Il existe des haori dans toutes les matières. HAORI - SYNTHETIQUE - Rouge Orange et Feuilles 1458. 羽織 VERITABLE HAORI JAPONAIS. Haori en fibres synthétiques. Quelques traces et taches mineures. Qulques fils tirés. Weight of the kimono: 550gr. Hemp (itchy material). Used, very good condition except for one super small hole on the back. Small and short! A (Total length): 136cm/53.5” approx. 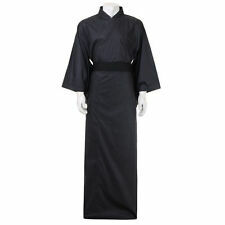 Gorgeous Black & White Japanese Hakama Kimono - two piece set fitting most sizes. Hakama (袴 ) are a type of traditionalJapanese clothing. They are worn over akimono (hakamashita). Hakama have seven deeppleats, two on the back and five on the front. 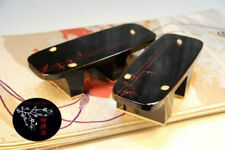 草履 ZORI Chaussures japonaises - Japon - pointure 37. Ce modèle est pour les pieds fins. Hauteur talon 5,5 cm, hauteur à l'avant 3,5 cm. Lanières tissu imprimé rembourrées en coton (made in Japan). Weight of the kimono: 740gr. Used but in an exceptionally good condition. A (Total length): 135cm/53.1” approx. MATERIAL . Design / Pattern: AJIRO background, SHIBORI (Tie-dye), Chrysanthemum crest, Gold embroidery. This KIMONO is designed with high-level artistry Japanese traditional technique by hand work. In my view this would be best fit for UK ladies size 10-14. Il existe des haori dans toutes les matières. Haorihimo ABSENTS. Quelques petits points noirs (peu visibles). HAORI - Rose motifs floraux 1370. 羽織 VERITABLE HAORI JAPONAIS. Provenance : Fukuoka, Japon. Weight of the kimono: 785gr. Used but in a very good condition, except for a couple of very small holes on the back. A (Total length): 137cm/53.9” approx. MATERIAL . C (Side seam to side seam across back): 61cm/24” approx. Over one thousand years ago court nobles wore linen Kimonos or “yukatabira” which were draped loosely over the body after taking a bath. 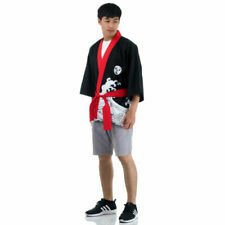 Washing information - Most yukata can be hand or machine washed at low temperatures. 小紋 着物 - KOMON KIMONO. Kimono en acrylique, quelques très légères traces. L'âge a donné une belle patine à la matière qui joue très bien avec la lumière. 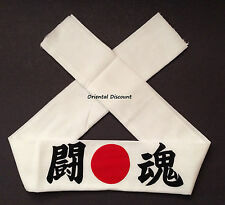 CELUI CI EST VENDU, A LA JAPONAISE, SANS OBI (CEINTURE). Design / Pattern: Plant, flower background, Arabesque, Embroidery. This KIMONO is designed with high-level artistry Japanese traditional technique by hand work. In my view this would be best fit for UK ladies size 10-14. Weight of the kimono: 520gr. Hemp (very itchy material). A (Total length): 138cm/54.3” approx. C (Side seam to side seam across back): 58cm/22.8” approx. Il existe des haori dans toutes les matières. SAUF 1 tache importante sur l'arrière de la manche gauche. Quelques traces mineures et défauts mineurs dûs à l'âge. Haori himo ABSENTS. Doublure intérieure en très bon état. 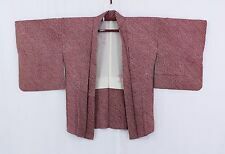 This is a slightly mottled dark pink kimono with an occasional design. Made in and imported from Japan. Weight of the kimono: 930gr. Used but in an exceptionally good condition, except for the lining which has yellowed with age. Weight of the kimono: 785gr. Used but in a very good condition. A (Total length): 130cm/51.1” approx. MATERIAL . C (Side seam to side seam across back): 60cm/23.6” approx. Horses, cannons, flowers and castles on an olive green background. Weight of the juban: 515gr. Wool, thin material. This item of clothing is made of wool, not the thick heavy kind that you find in knitted jumpers, but fine as in a cotton fabric. 草履 ZORI Chaussures japonaises - Japon - pointure 36 37. Ce modèle est pour les pieds fins. CHAUSSURES ASSEMBLÉES AU JAPON ET IMPORTÉES DEPUIS FUKUOKA. RESPECTANT CES OBJECTIFS, NOUS AVONS ETABLI UNE CHARTE QUALITE . A l'origine reservé à l'intérieur, on le voit porté sur un yukata pour se rendre au matsuri désormais. 兵児帯 HEKO OBI NOIR avec shibori. VERITABLE OBI JAPONAIS. Longueur du obi : 320 cm. Largeur du obi : 65 cm. Ces fils (très faciles à couper) gardent le yukata dans une parfaite position de pliage et de transport. Le yukata est le kimono le plus léger et le plus simple à porter. 浴衣 VERITABLE YUKATA JAPONAIS. 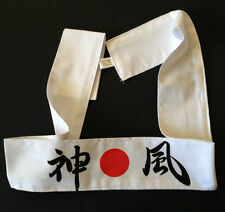 半幅帯 HANHABA OBI - Ceinture japonaise. VERITABLE OBI JAPONAIS. Longueur du obi : 395 cm. Largeur du obi : 16,5 cm. Idéal pour yukata japonais. Made in Japan - Import direct Japon. RESPECTANT CES OBJECTIFS, NOUS AVONS ETABLI UNE CHARTE QUALITE . Mt Fuji and a dragon on a grey/blue background. Weight of the juban: 260gr. Silk, VERY thin material. D (Sleeve width): 48cm/18.8” approx. A (Total length): 139cm/54.7” approx. MATERIAL . CONDITION . Used, poor condition as there are several marks (more than how many we can show in the photos). Weight of the kimono: 910gr. A (Total length): 155cm/61” approx. MATERIAL . 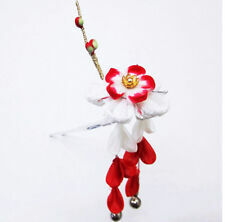 半幅帯 HANHABA OBI - rouge à motifs floraux. Belle tenue. VERITABLE OBI JAPONAIS. Longueur du obi : 332 cm. Largeur du obi : 18 cm. Provenance : Fukuoka, Japon.